Subscribe to Airspeed through iTunes or your favorite other podcatcher, listen to audio at http://airspeed.libsyn.com/, or download directly at http://media.libsyn.com/media/airspeed/AirspeedCirrusG3Part1.mp3. Another installment of flying OPA (other people’s airplanes)! 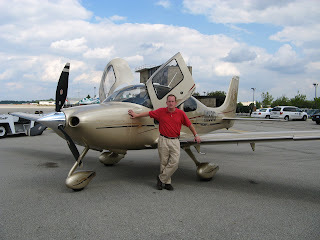 I took a ride in the Cirrus SR22 GTS Turbo pictured here. Cirrus Design and AirShares Elite attended the annual open house a few weeks ago at my home airport, the Oakland County International Airport (called “Pontiac”) (KPTK) and brought along three gorgeous Cirrus SR22s, all with the third-generation technology recently introduced by Cirrus. I’ve see the Cirrus display at Pontiac several times, but have always been on duty with the Civil Air Patrol and unable to go try to get a demo flight. 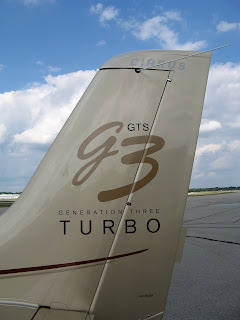 But with Cirrus’s introduction of the G3 line this year, I decided to make a special effort and drop in on the Friday prior to the open house for a demo ride. I went with high expectations and I was not disappointed. You’re going to have to listen to the audio of this ride to get the full effect. (See above for the direct link to the audio). It’s much easier to listen in to the cockpit conversation and you get a better feel for the experience. That said, here are some highlights. It’s a gorgeous aircraft and it flies like . . . What the hell does it fly like? How do you explain doing 1.3 Vso banked over 45 degrees and still feeling effective aileron control? 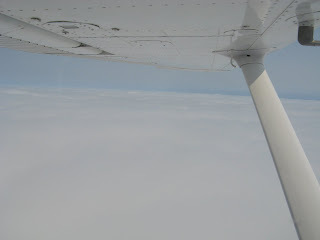 Climbing at nearly 1,400 FPM on a warm day with three guys in the aircraft? It’s just wonderful. Am I a Cirrus fanboy? Maybe. I’m a C-172 jockey and don’t fly a lot of high-performance aircraft. So, in fairness, it’s possible that I would have been just as wowed by any high-performance aircraft and that Cirrus has no special sauce. But I think not. The handling, intuitive controls, and responsiveness sure felt special. The airplane just obeyed. Know what I mean? I concluded long ago that it was unlikely that I would ever launch single-pilot IFR into anything hairier than a 200-foot broken layer. 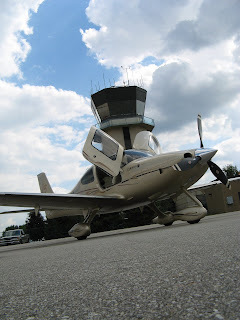 But I could really imagine the SR22 being a genuine go-places airplane that could be a fully-adequate platform for single-pilot IFR, even by a relatively low-time pilot like me. Sure, I’d want to train up and become thoroughly familiar with the systems and maintain currency and proficiency. But the point is that this aircraft made me seriously re-think the idea of single-pilot IFR in the first place. It’s that capable and robust. It made me re-think the potential missions that my instrument ticket would open up to me. Here’s the aircraft from the front. Those gull-wing doors are more than just pretty. They allow the back seat passengers to step from the wing into the rear footwells while still standing up. They need then only sit down and buckle in. No crawling onto the aircraft all bent-over. And the three-bladed composite prop grabs air in front of you and turns it into air behind you efficiently and effectively. Gorgeous interior. All white leather. 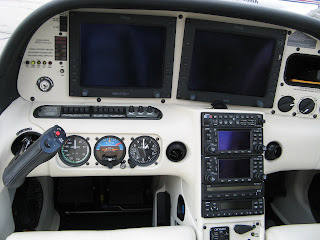 This shot shows the Avidyne glass panels and other avionics. Radios and autopilot are on the center post. Throttle and mix on down by your leg. Side-stick controls are completely intuitive for the yoke-jockey and I can’t imagine that stick-and-rudder flyers would have much trouble transitioning. The flight displays, coupled with the side-stick controls, make the frontal presentation elegant and intuitive. It’s like flying your living room. Only the inertial forces are cooler. And the PFD is actually better than my TV. These show notes just scratch the surface. Make sure that you listen to the audio. In addition to this audio, Part 2 will feature an interview with Cirrus co-founder, chairman, and CEO Alan Klapmeier. Look for the episode in a couple of weeks. 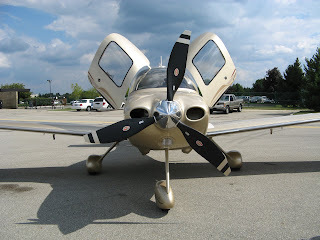 * Weights and loading based on base model SR22 Turbo configuration. Actual Useful Loads and individual aircraft weights will vary depending on options installed on aircraft. 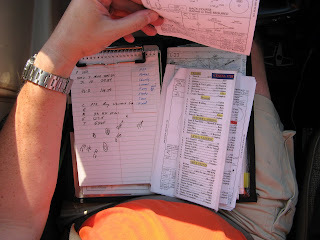 Always consult specific aircraft weight and balance data for flight planning. This is a regular blog post. If you’re looking for show notes from an episode, please see below. 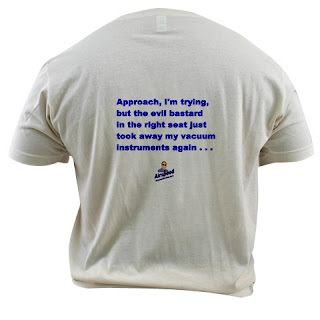 So get your Airspeed gear today at www.cafepress.com/airspeedonline. Great rags. Great podcast. What’s not to like? This is a regular blog post. Looking for show notes? See below. 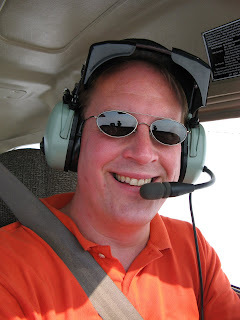 Will Hawkins of The Student Pilot Flight PodLog is starting his next venture in the Podsphere! Will has already posted Episode 0 of The Pilot’s Flight PodLog. See http://pilotwill.libsyn.com/ and subscrbe through iTunes or your favorite other podcatcher. Will will swap stories of his aviation exploits with guests and feature yet other accounts by listeners and other contributors. 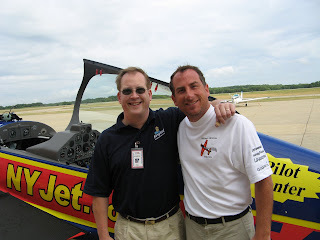 Look for the first full episode soon, which is slated to feature hangar-flying with Pilot Kent of The Pilotcast. Yours truly will also join as soon as Will and I can both carve out some time. Subscribe to Airspeed through iTunes or your favorite other podcatcher, listen to audio at http://airspeed.libsyn.com/, or download directly at http://media.libsyn.com/media/airspeed/MancusoRide1.mp3. 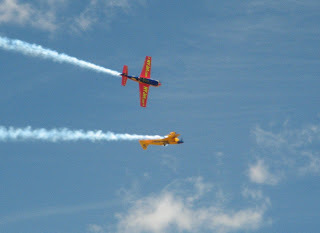 The second of my 2007 aerobatic rides! The show starts out with an update on my instrument training, including cockpit audio. Then we get into the ride, complete with audio from the MicroTrack 96/24 plugged into the Extra’s intercom. Michael Mancuso is in his 10th year doing shows. He has 7,000 hours total time and commercial and instructor certificates. He started flying gliders at age 11 and soloed for the first time when he was 13. 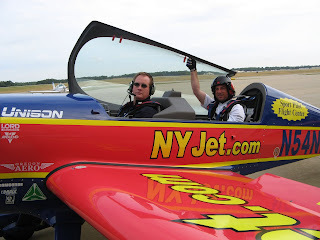 He and his family own Mid Island Air Service on Long Island in New York and Michael started Gyroscopic Obsessions in 1995 to teach aerobatics. He competed in IAC aerobatics from 1992 to 1997 and then spent from 1998 to 2000 with the Northern Lights. Michael flies the Extra 300L. The 300L is about 23 feet long and nine feet tall at the tail, and has a wingspan of about 25 feet. 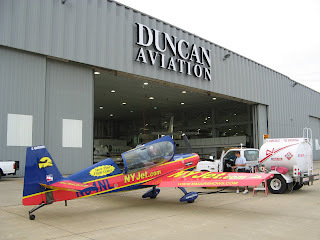 It’s powered by a Textron Lycoming AEIO 540-L1B5 300 horsepower engine connected to an MT three-blade prop that pulls the aircraft through the air at 170 knots when cruising at 75% power. It’ll get off the pavement in 315 feet, climb at more than 3,000 feet per minute, pull plus and minus 10 g’s, and do all kinds of crowd-pleasing gyrations between its 55-knot stall speed and Vne of 220 knots. The aircraft is built in Germany and certified in the United States. The Extra on the ramp when I arrived. Taking on fuel and getting ready for a morning of flying media riders. How nice is Mike? And I’ll bet you that going that Extra mile (pun intended) gets really valuable exposure for his sponsors that they wouldn’t otherwise receive. All this and flying two demos a day at the actual show? That’s hard work. The guy scheduled to go after me cancelled when he got his signals uncrossed and figured out that this was an aerobatic flight and not a balloon ride. Gotta pay attention to who’s in town, my friend! This is Michael Mancuso we’re talking about! Anyway, since when does a balloon ride start at 9:00 a.m.? Not with any balloon pilot with whom I’d ride. Arriving back after the ride. My glasses came off as I took off the headset and – “sproing!” went flying into Michael’s lap. That’s alright. A ride like that and I’m set for the week. Last shot on the ramp for the day. 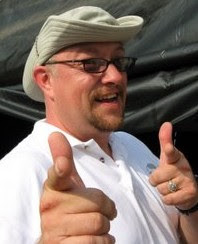 Then it’s time to go sit in the Meijer parking lot and let my vestibular system reset while awaiting the Blue Angels’ arrival a few hours later and the rendezvous with photographer par excellence Dan McNew for the interview with Craig Olson. 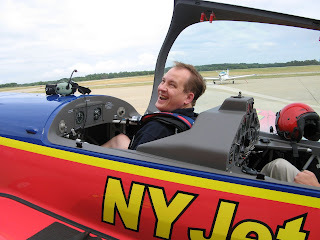 Great interview with a great naval aviator, but the ride makes Michael the Airspeed MVP for this trip to BTL! Here’s the maneuver I discuss in the audio. Michael performs barrel rolls around an inverted Matt Chapman’s track on Sunday. You need to be on the ground and at the fence to really appreciate this. Precision in all three axes and power management to boot. Unreal. I hope the non-pilots in the audience recognize the difficulty of this thing that Michael makes look so easy. This is a regular blog post. If you’re looking for show notes, please see below. Can anyone think of a better way to spend a Monday morning than weaving up and down through a 500-700 foot thick overcast layer shooting instrument approaches? So can I, but Winona Ryder was unavailable. Nailed five of them (summarized in the title to this post). Flew it mostly with the hood up because I like to have two fully-functional pilots in the cockpit when I’m in actual. Plus, even the cockpit of a C-172 seems a lot bigger without the hood on. My eminently-organized kneeboard. ATIS and clearances on the left. Approach briefing cheat sheet at the top right of the pad. 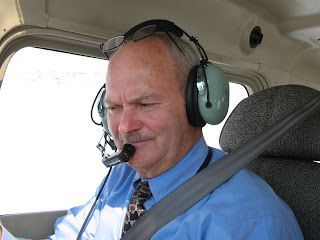 Climb, cruise, descent, and pre-landing checklist usually on top on the right followed by other approach plates, the IFR low-altitude en route charts, spare taxi diagrams, then my leg. Energency checklist dangles on the side to my left in the third panel of the kneeboard. Don’t know how I’m ever going to fly center stick because I really like this kneeboard configuration. At least I can still keep the pen Velcro-ed to my noggin. 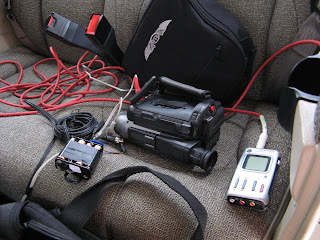 The multimedia capture area (sometime known as the back seat). M-Audio MicroTrack 96/24 on the right to capture audio. Old Sony Handicam with analog video input in the center. Battery pack for the bullet cam next to the Sony. Bullet cam is mounted with Velcro to the top of the mag compass in front. No apparent adverse effect on the mag compass. Wish I had remembered to hit REC once I confirmed that I had signal! Anyway, I’ll get some video on the next appropriate flight.